Have you heard of "Farm Fresh to You"? 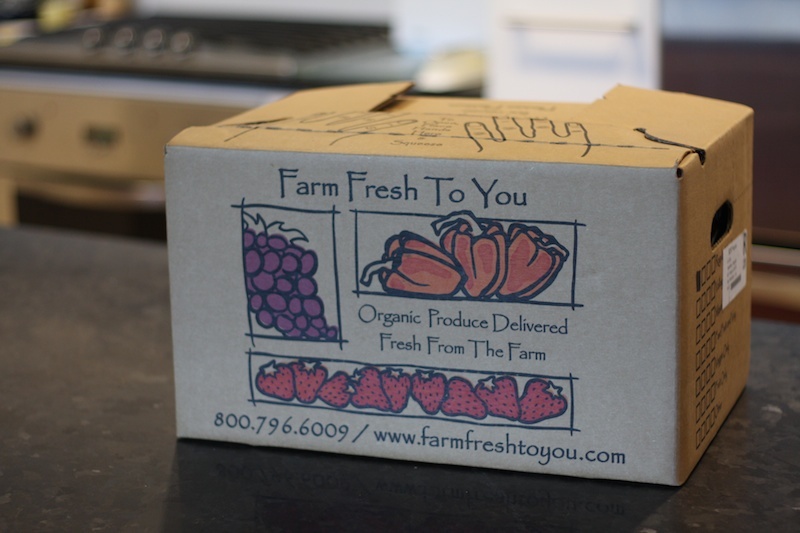 It's just as it sounds, farm fresh fruits and veggies delivered directly to you. As people are becoming increasingly interested about where their food comes from and how it was grown, Community Supported Agriculture (CSA) is becoming a popular alternative for getting high quality food from a trusted local farm, Farm Fresh To You. By joining our CSA, families are connecting directly to our farm, Capay Organic, and are receiving regular deliveries of nutrient rich, mouth watering, organic produce delivered directly to their home or office. Well, I've been considering this service for years. A few friends have tried it and liked it so I was curious. So when I saw a Groupon deal for 1/2 off your 1st delivery, I couldn't resist trying. My first box arrived today. It's kind of exciting! It arrives mysteriously over night (they deliver it during the coolest part of the day) and is left either on your doorstep or with your doorman. Then when you wake up in the morning, there's a big box full of veggies and fruit that you have no idea what could be in it. It's a big surprise! Of course, when you sign up you can fill out an "exclusion" list of items you never ever want to receive like mushrooms, for instance. Blech! Actually, I just noticed that in the beginning of the week, they post a list of tentative items that might be in your box, so I guess if you're curious, you can check it. But it's really fun opening up that box with no idea what could be in it. Everything is certified 100% organic and as much as possible, from local (Bay Area in my case) farms. If you want to know where they each produce is farmed from, you can go to their website and it'll tell you. They include a packing list, so like, when I saw those 3 itty bitty pear-shaped fruit things and I didn't know if they were pears, or figs, or ??? I just looked a the list and saw that they are seckel pears. I donno what seckel pears are compared to any other pear, but that is part of the fun. So are you curious as to what was in my first box? So...you may wonder? Because I do...will i actually use everything in this box? That is the big challenge! I honestly and truly hope so but there are 2 items I am worried about. I'm not exactly a fan of radishes. I'll eat a tiny bit of it...it's nothing as horrible as a mushroom, but it's far from my favorite. But Jimmy sort of likes them, so I'm a little worried about those. And then there's that big leek. I've never used leek before. 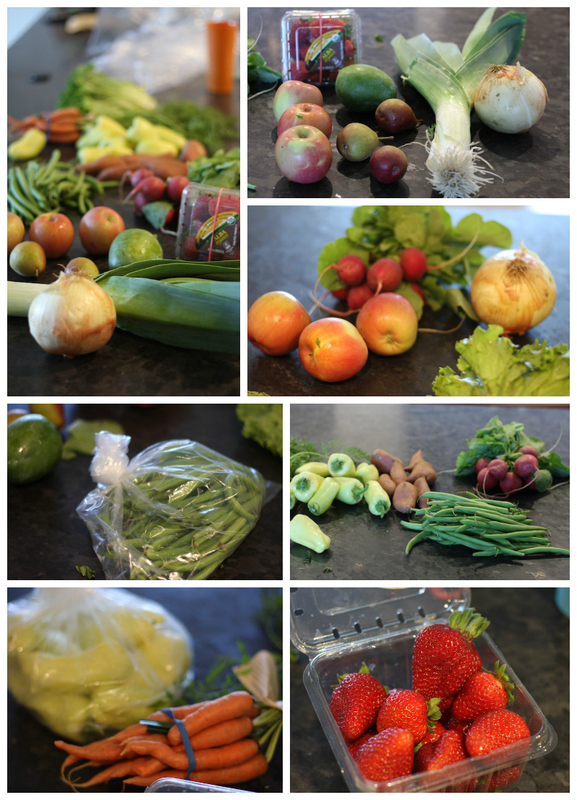 Their website provides recipes for all of their produce, plus having the internet right at my fingertips makes it easy to figure out what to do with them. But as it is we use onions sparingly, so with a yellow onion AND a leek, I'm not sure what will happen to it. Of course, I have a good network of local friends who might be able to take it off my hands along with 1/2 of those radishes, but I think it'll be fun and challenging to figure out what to do with everything in that box, even the stuff I'm not quite sure of. My favorite things in the box are the green beans, sweet potatoes, and strawberries. I'm gonna roast some sweet potatoes with a little onion, some sweet peppers and carrots. That'd be a good side dish with either pork chops or grilled chicken. I love mango, it's one of my favorite fruit, but i've never had a keitt mango, so I'm very curious about it, as well as those seckel pears. They included a little note in the box about the Keitt Mangoes, which was good to read, because "unlike other varieties of mangoes, the skin of the keitt mango is still green when it is ripe." I would have been waiting for a very long time for that to ripen on my counter, but it looks like it'll be ready to eat in a couple of days. They also included a recipe for Mango Coconut Rice and Mango Salsa. I signed up for delivery every 3 weeks since it's just the 2 of us, and Jimmy doesn't eat a lot of veggies. Fruit yes, veggies...not so much. They can deliver weekly, every other week, or on an every 3rd or 4th week frequency. It's easy to change frequency online, if I feel the need. And I might consider excluding radishes and leek in future deliveries. We'll see. Anyhoo...I just wanted to share my newest "hobby"...I can't think of any other description other than that. I'll try to let you know how recipes turn out, if there's anything exciting worth mentioning. We tried this a few years ago and during the winter time there were a lot of leeks. This was before you could exclude items! I made vegetable soup and stews and included the leeks. I used this service back when I was pregnant. It was awesome cuz I got them to deliver it to my work at the time. Enjoy!